We are here to help homeowners make the right decision when it comes to protecting their property from leaks & water damage. There is a lot to know so we want to provide you with helpful Repipe Information & Facts. What Is Repiping And What Does It Involve? Repiping is the full abatement of the Hot & Cold pressurized water lines in your home. Replace the system with new properly sized lines. Install new 1/4 turn Emergency Shut Off Valves. Repair drywall and stucco patches. Texture the patches. We have a Lifetime Warranty on ALL PEX- A Water Pipes and all Labor Workmanship. Why Am I Having Leaks? Leaks are caused by old worn out materials, low grade or recycled materials or poorly installed systems. Even the newly constructed homes can leak due to the new copper lines are made with recycled materials from China. Call us for more repipe information. Copper Pipe- Chinese-made imported copper pipes were widely used during the housing market boom. Galvanized Steel Pipe- Galvanized pipe was used heavily prior to 1960. Galvanized Steel Pipe reacts with the minerals in water causing Calcium Deposits that clog pipes, rusty water and cracks in the pipes. Polybutylene Pipe- Polybutylene pipes will leak without warning and can be caused by many factors. Correctly done PEX repipe will eliminate low water pressure, brown or rusty water and provide better tasting water! What Does a Copper Repipe Cost? The price for copper Aliso Viejo repipe, CA will vary depending on the size and type of home, but the average for a 2 bathroom home is $5500- $7000. Call us for more repipe information at 877-473-7473. What Does a PEX Repipe Cost? The price for PEX Aliso Viejo repipe, CA will vary depending on the size and type of home, but the average for a 2 bathroom home is $4000- $5000. That is including the entire repipe of your home, to the drywall and texture repair. With NO Hidden Fees or Taxes! Integrity Repipe has over 26 years of experience in Repiping, Rerouteing, and Slab Leaks and is rated #1 in the country. Integrity Repipe has been delivering results since we opened in 1990. Our goal is to provide both a superior customer experience and tremendous value for our customers. Integrity Repipe’s highly trained technicians use non-invasive leak detection equipment (ultrasonic electronic meters, thermal imaging, infrared thermometer and acoustic sensors) to accurately locate the leak to save time, money and avoid unnecessary property damage. 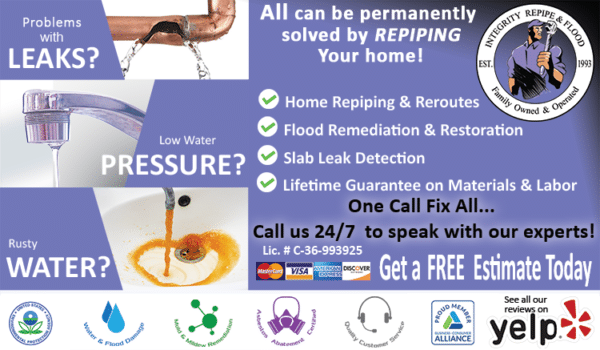 Call us for all your copper & PEX Aliso Viejo repipe! Guaranteed repairs: Integrity Repipe repairs are backed by a Lifetime Warranty. Fully licensed and insured: Integrity Repipe is fully licensed and insured for your assurance of quality workmanship. Respect for your home: Your home is important to you. You want technicians that respect it and understands that you value cleanliness and tidiness. Respect for your time: You have a busy schedule, so choose a team that respects your time. You make an appointment, and we will stick to it. Flat rate price, up-front: When you choose Integrity Repipe you know the price up-front, its peace of mind for you. Joe Ludlow is not only the founder of Integrity Repipe Inc, He is also the pioneer who started the entire PEX repipe industry in the USA and continues to offer the best quality and service in copper & PEX repiping. Don’t be fooled by imitators, he is the original Aliso Viejo Repipe Specialist! Our crews are Certified, Highly Trained and Experienced. We offer a Lifetime Transferable Warranty on ALL PEX- A Water Pipes and all Labor Workmanship.